This is the perfect movie for a laid-back, lazy Sunday afternoon. A nice glimpse at an easy-going Irish lifestyle filled with pleasant people who want nothing more than to enjoy each others’ company. “The Quiet Man” follows Sean Thornton (John Wayne) as he moves from America to Ireland in the 1920s, and intends to buy back the land his Irish family once owned. 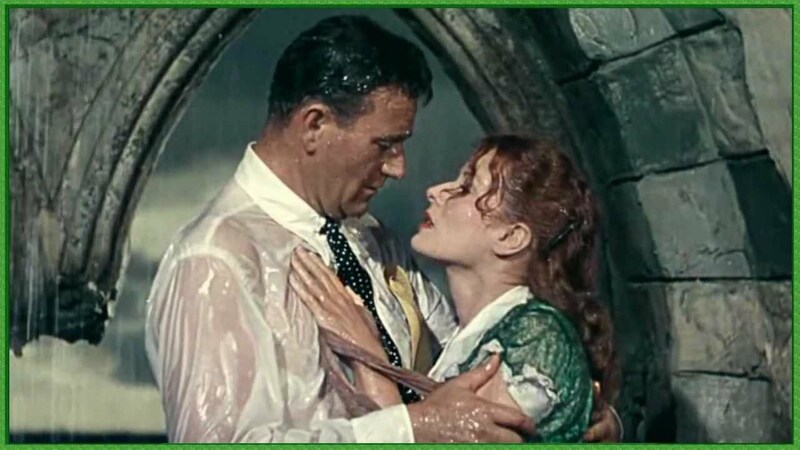 As he does, Sean falls for young Irish girl Mary Kate Danaher (Maureen O’Hara) and intends to marry her. But Mary Kate is devoted to her Irish traditions and won’t marry Sean without the approval of her brother, Will (Victor McLaglen), who despises Sean for taking land that he felt belonged to him. 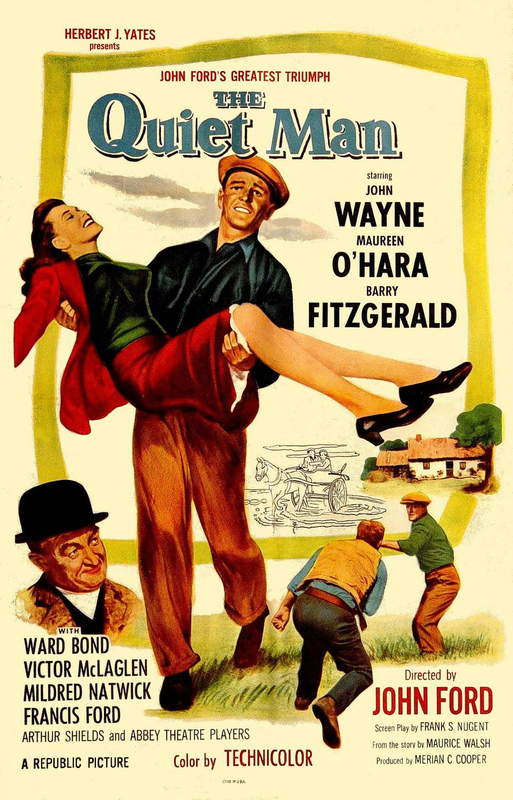 The title “The Quiet Man” works perfectly for John Wayne, not because he doesn’t talk much, but that all he wants is quiet and pleasant lifestyle, which he feels can be achieved in Ireland. His biggest worries here are courting Mary Kate and rebuilding his home, which everyone in town is more than willing to pitch in (or at least give him a flower to plant). He cares little about money or petty squabbles with Will, since he knows that won’t bring him peace. “The Quiet Man” was directed by John Ford as a love-letter to Ireland, where both of his parents were born, and makes full use of its technicolor landscape, as the bright yellow-and-orange sun sets over the deep green hills that stretch for miles. Or the rippling rivers with their stony bridges contrasted by the massive blue skies. Watching this film is like spending an afternoon looking up at the clouds and making shapes or animals out of them, doing so without a care in the world. Like any good John Ford movie, there is a wide range of colorful characters, all of whom love conversing and their pints of alcohol. From the nosey cabbie Michaeleen Flynn (Barry Fitzgerald), to the loud priest who loves to fish Peter Lonergan (Ward Bond), to the rich widow who loves controversy but hates people Sarah Tillane (Mildred Natwick), there is no shortage of wacky Irish folk here. Overall, “The Quiet Man” is one of the most relaxing and peaceful movies I’ve seen in a while. It is an appreciation of the Irish, their culture and their landscapes, as well as how accepting they are of letting outsiders in. John Wayne offers his usual bravado, especially when he feels he has to marry Mary Kate the moment he sees her, but that just makes the cultural differences so funny and captivating. Watch this one to help you unwind after a long day or if you want one of the best looking Irish films you’ll ever see.